Gourmet Secrets’ Celiac Friendly Selections! Posted on August 26, 2013 by Gourmet Secrets Inc.
At Gourmet Secrets, we want everyone to be able to enjoy the highest-quality and finest food at great value. Burgers, hot dogs, liver pâté, all of these are great foods in and of themselves, or ingredients for your next homemade recipe, but to the chagrin of some, wheat is normally found as a binding agent in all of these products. While using wheat helps keep the shape of the food together as it cooks, it makes these foods unpalatable for those with allergies or intolerances to gluten. When you order from Gourmet Secrets, you don’t have to choose between your food or your allergy: they provide a wide selection of gluten free products that you and your family will love! Order some Sweet Italian Sausages for that great Italian flavor, or Hot Italian Sausages for that extra kick for your tastebuds. The Original Smokies are fully cooked and ready to eat right out of the fridge with some honey or Dijon mustard! If you’re raring for something different than bacon or ham in the morning, our Breakfast Sausages will charm you with their morning aroma as you fry them up with eggs and toast! Are you a fan of hot dogs? 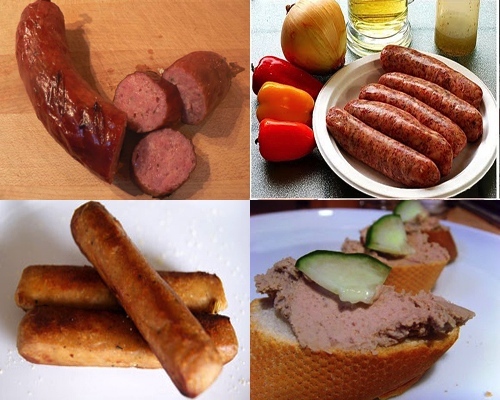 Don’t settle for the grocery store brand: Gourmet Secrets’ European Wieners are made with 100% free-range pork meat and great for steaming up when you’re watching the ball game or going out for a picnic! And if those still aren’t big enough for you, they offer 16oz Farmer’s Sausages full of pork and spice flavor which will be the delight of your next recipe, whether in pastas, besides chicken or in an omelette! Visit Gourmet Secrets’ online store today and check out their gluten-free selections: you’ll be amazed by the taste and quality! Don’t wait- order today! Posted on July 30, 2013 by Gourmet Secrets Inc.
A flaky yet firm fish, full of delectable ocean flavor, renowned around the world and found right here at home in Canada… it’s gotta be salmon! One of the most popular food fishes in the world, salmon is beneficial for human health as it contains a high quantity of protein, omega-3 fatty acids and vitamin D. Prepared in numerous ways from cedar-smoked to rolled with king crab and cream cheese, or grilled plain with lemon juice, salt and pepper, this flavorful fish is welcome at dinner tables across the world. Salmon are fish in the Salmonidae family, which are typically born in fresh water and migrate to salt water as they mature. They have the uncanny ability to return to the exact lake in which they were born, generation after generation, a homing sense primarily powered by smell memory! When they return from off the coast of BC to their inland spawning lakes, the salmon runs are so massive that some say you can walk across the river on a bridge made of salmon! These also present a prize opportunity for bears, wolves and other predators to catch as much salmon as they can- salmon fishermen have also enjoyed the plentiful bounty they catch from these yearly salmon runs. Increasingly, however, the importance of keeping a large salmon population in the rivers is fueling the increase of aquacultured, or farmed salmon, in Canadian markets. While our BC salmon products come entirely from wild stocks, our Atlantic salmon selections are farmed. The intricacy of salmon farming is not lost on Gourmet Secrets, and we ensure to source our product from the highest-quality aquacultures following the highest safety and feed standards. As with all our seafood and fish products, our salmon selections adhere to the Safe Quality Food Level 2 guidelines which are some of the strictest in the country. This marvelous fish is available in a myriad of prepared and raw fashions for you at Gourmet Secrets’ online store. Make salmon a part of your diet today with Gourmet Secrets’ help! Posted on July 15, 2013 by Gourmet Secrets Inc.
Good morning Gourmet Secrets! A plateful of eggs, some hash browns, a tall glass of orange juice and buttered toast, now that sounds like the breakfast of champions. But there seems to be something missing… Gourmet Secrets’ celiac-friendly breakfast sausages! Toss a few of these links in the frying pan until they are golden-fried and serve beside eggs, potatoes and toast for a complete breakfast! These breakfast sausages are made of 100% free-range Alberta pork, seasoned with aromatic spices and salt that create the delicious aroma that wafts in the air in the morning. The best part- these sausages are free of gluten as a binding agent, and thus are safe for celiacs and those with wheat intolerance to eat! Great for breakfast, as per their name, they can also be used as ground meat for tacos and nachos by cutting open their casing and frying up the ground pork with tons of sautéed peppers, onions and taco spices. Sprinkle this tex-mex mixture on top of tortilla chips and cover with shredded mozzarella for the best nachos this side of Canada! You can even take out the meat from the sausages and make delicious pork patties that will be a hit in your next big barbecue! Make your morning, afternoons and evenings more exciting with Gourmet Secrets’ celiac-friendly breakfast sausages, only at http://www.gourmetsecrets.ca! Posted on July 10, 2013 by Gourmet Secrets Inc.
Breakfast: the most important meal of the day. In our busy lives, we rarely have time for a decent breakfast anymore, but once you wake up to the wonderful smell of Gourmet Secrets’ deluxe bacon throughout the house, you’ll never want to skip it again! Our bacon from 100% free range pork is deluxe trim, double maple and big on taste, always a treat to have around whether it’s for breakfast, lunch or dinner. Bacon is usually made from pork belly cured in brine or dry salt for many hours, then smoked and sliced into thick strips that produce the streaky bacon we know and love. Bacon is often enjoyed beside eggs, potatoes and toast and is very popular as a sandwich meat, being a key ingredient in the preparation of a BLT. If you prefer something greener and healthier, cook up your bacon until crispy, chop it up into small chunks or bits, and use it as a garnish for your salad! Often very popular in dressings and sauces when rendered into tiny bits, you can make your own bacon ranch dressing by simply combining mayonnaise, white vinegar, parsley and bacon bits! Bacon also features as a garnish for many of our products, whether it is wrapped around our filet mignon, chicken breasts or scallops, or stuffed into our premade baked potatoes. Why not try Gourmet Secrets’ deluxe bacon in your own dishes? If you love bacon, don’t settle for anything less than the best. Get some of Gourmet Secrets’ Deluxe Bacon Strips today at http://www.gourmetsecrets.ca! Posted on July 9, 2013 by Gourmet Secrets Inc.
What says “summer” more than a freshly-grilled burger patty with all kinds of crisp vegetables and sauces between two burger buns? Not much- and Gourmet Secrets’ celiac-friendly Angus steak patties will be sure to bring that backyard barbecue experience to new heights! One of our most popular products, the Angus steak patties are made of 100% Angus beef chuck steak, ground and formed into a patty with a few seasonings like beef stock and ground black pepper to bring out that great burger flavor! These are also some of the largest patties you’ll ever have tossed on the grill, weighing in at 6 ounces. But one of the most subtle differences lies in something that is often overlooked in other burger recipes: this product is part of our celiac-friendly lineup, free of wheat products in their ingredients! In the case of our famous steak patties, carrot fibers are used as a binding agent for the patty instead of wheat flour, which makes them safe to eat for someone with gluten intolerance. Make your next barbecue a hit with everyone with the Gourmet Secrets Reserve Homestyle Steak Patties! Posted on July 5, 2013 by Gourmet Secrets Inc.
What is more regal than a fully-cooked lobster served with melted butter and a variety of accoutrements on the table? Not very much! Gourmet Secrets is proud to bring you live lobster right at your doorstep for free in the Gourmet Secrets Live Lobster Festival, ready for the pot and then the table! But how much do you know about lobster, besides its delectable flavor and tender texture? Nova Scotia lobster belongs to the species Homarus americanus, which makes its home in the warm waters of the Atlantic, from the Labrador in Canada all the way to Cape Hatteras in North Carolina, though it is uncommon south of New Jersey. With members of the species measuring up to 64 cm and weighing in at over 20 kilograms at times, it is the heaviest and one of the longest crustaceans in the world. Because it is a crustacean, it was once considered food for the poor; today, lobster is the example of fine dining, and highly sought after for its great taste and texture. Contrary to what would be expected, lobsters are not naturally red: their shell contains a mixture of pigments which gives them a green and brown color. When it is cooked, almost all the pigments get degraded by the heat, except for the one which makes the shell red, thus making the lobster a rich red color once it is ready to eat. However, in the wild, lobsters can come in a variety of fantastic colors such as bright blue, stark yellow, and even albino white! The traditional way of cooking lobster is with a live boil: simply drop the lobster into a pot of boiling water head first and boil it until its shell becomes completely bright red. Then pluck it out of the water and serve it on a plate with lobster crackers, clarified butter and some mashed potatoes and steamed vegetables to enjoy on the side! Gourmet Secrets wants to bring you your very own live lobster for your dinner feast, so come on: call right now at 1-877-254-0222 and get your Lobster Festival Pack today! Gourmet Secrets’ Live Lobster Festival! Posted on July 3, 2013 by Gourmet Secrets Inc.
Summer is here, and it calls for parties, barbecues, potlucks and clambakes! To celebrate the season, Gourmet Secrets is launching its first-ever Live Lobster Festival- a chance for you to get a variety of great food for your next gathering and throw in two one-and-a-half pound live Nova Scotia lobsters in your order! With three specialty packs available, bring home some delectable food from Gourmet Secrets this summer and enjoy the freshest Nova Scotia lobster right at your doorstep! There are only 2000 lobsters available, so call now at 1-877-254-0222 and reserve yours today!